Considered one of the nation’s top three business centers and the closest of the three to the U.S. border, Monterrey has a flourishing hotel, restaurants and business infrastructure and a wide assortment of cultural and tourist attractions. The USMCOC-NE organized a members-only roundtable discussion with Ambassador Ruben Beltran, Consul General of Mexico in New York in August. Ambassador Beltran led an outstanding discussion on the Mexico-United States bilateral agenda, including the most relevant topics such as the current Mexico’s drug war, the pending energy reform, the immigration agenda, the upcoming U.S. elections, and the economic projections for these two countries. The USMCOC-NE plans to hold these types of discussions on a regular basis in an effort to promote understanding and communication on bilateral issues between the two countries. On past days the Northeast Chapter of the United States – Mexico Chamber of Commerce invited me to participate on its Mexico’s Custom and Trade Facilitation seminar held at New York City, same that resulted in a very gratifying experience for all the participants. 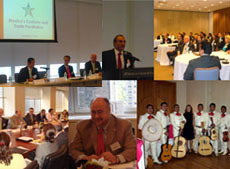 Being a Mexican lawyer in a United States forum represented a challenging experience, as my goal was to transmit the new measures taken by the Mexican government in order to improve its custom and trade policies while addressing a audience that is not fully familiarized with the Mexican legal system. Suggestions ­ Click to send questions, comments or suggestions. Sign up ­ Click to receive a free subscription to USMCOC-NE newsletter. Unsubscribe ­ Click here to unsubscribe from USMCOC-NE newsletter. Change e-mail ­ Click to send USMCOC-NE newsletter to a different address. The Management Committee: Rodrigo Amaré, Eduardo Ramos-Gómez, Pat Sabino, Alexis Rovzar, Jorge Mariscal, Denise Simon and Rosemary Werrett. Alejandro Ramos, Executive Director; Isabel Fernandez, Trade Representative.